‎"Due to the FAA lifting its instruction to all United States' airlines to suspend their flights to Israel, and the European safety regulator EASA following suit, EasyJet will operate its services to and from Tel Aviv as scheduled from Friday 25 July," the budget carrier said. The US Federal Aviation Administration (FAA) had first imposed its ban on Tuesday after a rocket fired from the Gaza strip landed about a mile from the airport. The European Aviation Safety Agency (EASA) followed the same day, saying it strongly recommended that airlines should avoid operating to and from Tel Aviv. The suspension in flights came less than a week after Israel began a ground attack in Gaza, and as airlines around the world re-thought their flight paths over conflict areas in the wake of the crash of Malaysia Airlines flight MH17 in eastern Ukraine. The US authorities extended their ban on Wednesday, citing the "potentially hazardous situation" in Israel and Gaza. But on Thursday they changed their mind. "The FAA has lifted its restrictions on US airline flights into and out of Israel's Ben Gurion Airport by cancelling a Notice to Airmen it renewed earlier today (Wednesday)," the regulator was quoted as saying by the AFP news agency. 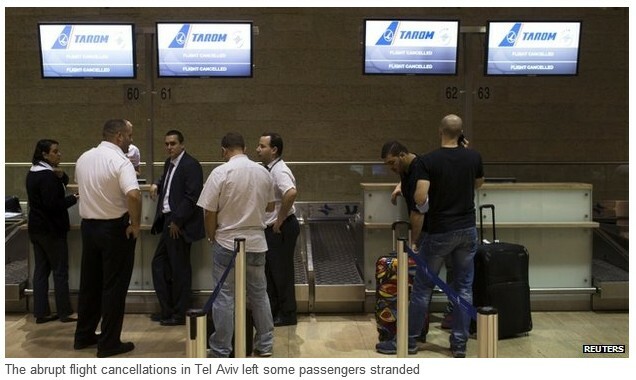 The flight cancellations drew criticisms in both the US and Israel. The initial US flight suspension prompted Israeli Prime Minister Benjamin Netanyahu to ask US Secretary of State John Kerry for help lifting the FAA ban. Israel's transportation ministry had said: "Ben Gurion Airport is safe and completely guarded and there is no reason whatsoever that American companies would stop their flights and hand terror a prize." On Tuesday, former New York Mayor Michael Bloomberg flew on Israeli airline El Al to Tel Aviv to "show solidarity with the Israeli people and to demonstrate that it is safe to fly in and out of Israel".